recycled bits of broken antique items. Sculptor Bryce LeVan Cushing Reveals Alien Life Forms in Grafton! After three successful shows in Spain this year (Drap Art 2010, N2Galeria Barcelona, N3Galeria Madrid) and a Best in Show win at the Grafton Fine Art Show in August, sculptor Bryce LeVan Cushing is not simply resting on his laurels. He has been busy preparing for the fine art show "Alien Intersection" at The Old Tavern at Grafton's Phelps Barn. The show, which features Cushing's sculptures along with the textile art of Frances Alford Holliday and watercolor paintings by Peter Jeziorski, opens on November 21 and runs through November 28. 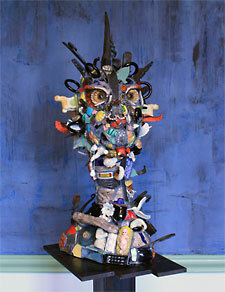 Cushing's sculptures are comprised of antique items that are broken and repurposed into recycled art. His new Grafton Forge Alien Series will be featured in the "Alien Intersection" show. Cushing has toured the United States extensively with gallery shows in Boulder, Colo. (Blink Gallery), Philadelphia (bahdeebahdu, 12 Gates Gallery), Tucson, Ariz. (DeGrazia Museum), The Niagara Falls Arts and Cultural Center, Le Petit Versailles (NYC), and many others over the past seven years. An exciting new art movement is happening in Grafton. Bryce LeVan Cushing and Frances Alford Holliday recently moved to the area to be a part of it. 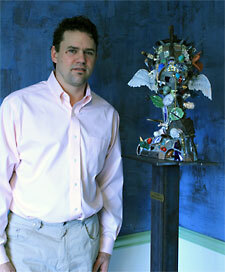 Jeziorski, owner of the Hunter Gallery of Fine Art, has been an artist in residence since 2005. "I am thrilled to debut my new Grafton Forge Alien series in my new home of Grafton, Vermont alongside the works of Frances and Peter," said Cushing. "To show along with complementary artists, all of whom now call Grafton home, is exciting for all of us. The goal of our show is to put Grafton on the map as a true art destination." On Sunday, November 21, from 6:00 to 9:00 p.m., several spaces will be open in town to celebrate their lives in Grafton in conjunction with the show "Alien Intersection." Visitors will be welcome to tour the Hunter Gallery, Embellishments Studios, the Jud Hartman Gallery, the Grafton Forge and the Phelps Barn, all of which are located in Grafton Village. The main location of the show will be The Old Tavern's Phelps Barn located at 92 Main Street. During November 22-28, the "Alien Intersection" show can be seen at Phelps Barn at The Old Tavern from 10:00 a.m. to 6:00 p.m. Details on the event can be found at OldTavern.com or by calling Cushing at his home studio, (802) 843-1162.